“When I walk through the door, it’s a home away from home,” said John, “kind of like the show Cheers; a place where everybody knows your name – that’s not a bar.” John Honn is one of our baristas, celebrating his three-year anniversary as an active Member of the Café and his fifth consecutive year of sobriety. During this span of time as a Member, John positively transformed his internal dialogue and ways of expressing himself outwardly. Much like a Zen practitioner, John tries to remain grounded in the present, rather than dwelling on mistakes made in the past. At age 52, he proactively seeks treatment for schizoaffective disorder and PTSD from a physical assault he suffered in his younger years. He attributes much of his emotional stability to medication. However, John has also found peace and serenity by acknowledging that there will always be scars in his past and obstacles in his path, and oftentimes there is not a straightforward or direct solution. John’s mind, which was once a cacophony of noise and activity, has also quieted to a low hum. “The voices have finally stopped, but it gets a bit lonely now,” he jokes. 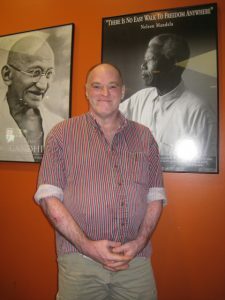 Although John has not completely eliminated his anxiety, he’s learned to use nervousness to his advantage; “It makes me more in tune with things around me.” This honed ability to connect with those around him has contributed to his success as a welcoming, thoughtful and responsive barista at the Café. John has excellent customer service skills and he adeptly dances between the espresso machine and coffee bar, brewing multiple coffee concoctions and calling out orders for Members, guests and staff – each cup prepared to perfection. Taking baby steps toward recovery is easier at the Café according to John. “Here everyone is recovering from something and it makes it better,” John said, earnestly. The camaraderie and shared mission of recuperating from substance use disorders, mental illness, and trauma encourages John to focus on the needs of others around him in the Café community. John made an insightful correlation between the welcoming atmosphere depicted in the television sitcom Cheers and our completely sober, yet equally boisterous Café. As the theme song goes: “You want to be where you can see our troubles are all the same; you want to be where everybody knows your name.” We are all facing recovery and John helps share the hope and compassion that define Recovery Café. A place where everyone is greeted by name with a warm, friendly smile.